The attic and shed are two of the easiest areas of our home to overlook when it comes to cleaning and organization. While we focus on rooms like our kitchen, bathroom, bedroom and basements, attic organization and shed organization are equally important to maintaining your home throughout the year. As we switch out our winter tools, equipment and clothing for backyard grills, lawn mowers and pool attire this summer, now is the perfect time to tackle these projects. Below are some tips to get your attic and shed more organized than ever. Create the space you need to thoroughly clean the floors, walls, ceilings and windows as the first step in your attic cleaning process. Remove all of the items from your attic temporarily, or consolidate those items into one confined area. After that, use a dust rag and damp cloth to dust the walls, window frames, and exposed rafters throughout the attic. After the dusting is complete, use a separate rag to wipe down all of the glass windows panes, doors and other hardware. Then, sweep the floors as the final step in your attic cleaning project. Begin your shed cleaning process the same way as your attic: remove everything you have from your shed so you can clean all areas of the space. Then, hose down or wipe off the dust, grime and cobwebs that gathered throughout the winter months and make sure the floors, walls and equipment you are storing are as clean as possible. 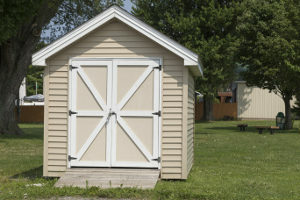 If your shed has windows, wipe down the inside of those windows and rinse off the outside with a hose. Before you place your items back after attic cleaning, designate which items you will keep, throw away, donate or store. Then, be sure to place like items together in your attic. You can use moving and packing supplies to box up those items for summer and get them out of the way. All of your Halloween decorations, for example, should be grouped in the same area as well as all of your winter coats and apparel. Keep your exterior Christmas lights, artificial Christmas tree and other decorations together, too. This will make your items easy to access and find as the seasons change throughout the year. After your shed cleaning is complete, the next step is shed organizing. Before you start moving everything back into your shed, think about what items you will be using the most. Your lawn mower, weed whacker, edger and garden equipment are things you will want to be able to access quickly and easily this summer. Place those items in your shed last closest to the door. This way you won’t have to waste time moving boxes and digging through your shed for what you need when it’s time to do your landscaping. Snow blowers and shovels are examples of things you will want to put in first near the back of the shed. Always make sure you are grouping like items together in your shed as well, and don’t save anything you no longer need; broken or damaged items should get thrown away so you can take full advantage of the storage space in your shed. Depending on the space you have available in your attic or shed, renting a self-storage unit for your winter tools and accessories may go a long way to maximizing attic organization and shed organization projects throughout the year. Storage World also offers storage units of all sizes at our multiple storage locations throughout the Atlanta area . Stop by to one of our three facilities today to see how we can help you get more organized this summer.